The Nebraska football game day experience is unlike any NFL experience. Like many college sports venues, the atmosphere is something you must experience to understand. You'll see red from the first moment you set foot in Memorial Stadium, where they put on one of the best shows in all of sports. Taken a step further, the college game's rarefied air swirls around Lincoln. This is the home of the University of Nebraska Cornhuskers, one of the nation's best programs since 1970. Perhaps you don't care much for records or Cornhuskers. No matter. This is a show even rivals and those with no affiliation come to see. They come from farm hamlets and suburban neighborhoods. Some drive 400 miles one-way for a three-hour game. Others buzz down Interstate 80 from Omaha at 75 miles per hour (the legal speed limit). But virtually all the fans who jam Memorial Stadium have at least this much in common: they wear some combination of red or white. This makes for a unique look as you walk to the campus. Little streams of red on the city's sidewalks that become rivers as you approach 10th Street, then a sea of red inside the stadium, which now holds about 90,000 fans on game day. ESPN Analyst and former Indiana coach Lee Corso once said Lincoln is the last place he'd want to take his undefeated team with a title on the line. There are other places where top-flight football is played, but here you'll see school spirit and sportsmanship in its simplest, most potent form. State spirit might be at stake, too. 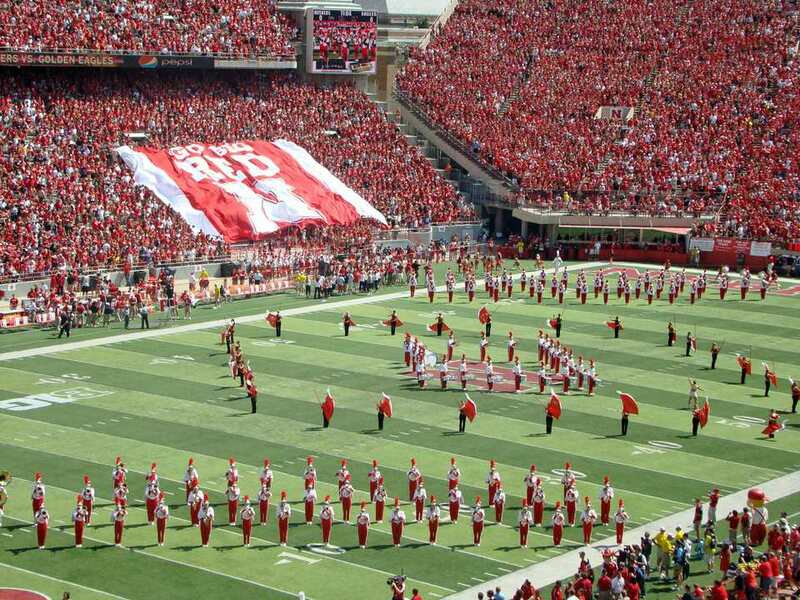 Nebraska is home to only 1.9 million people and one major university playing Division I-A football. No divided loyalties here. That's one reason the Nebraska crowds are among the most football-savvy in the land. They are also rated highly for sportsmanship. Every game, win or lose, thousands of fans give the opposing team a standing ovation as it enters its dressing room. When is the last time you saw that at your favorite NFL stadium? Memorial Stadium is home to a huge jumbo screen more than 100 feet wide. It's part of a system called, naturally, "Huskervision." It's the kind of thing you'd expect to find in the NFL, only bigger. Lincoln (population 265,000) is Nebraska's second-largest city, but it offers the hospitality of a smaller town. People greet strangers with a special brand of Midwestern hospitality. Parking can be a problem, but it's possible to reserve garage space in downtown garages as late as a few days prior to the game. The streets are packed on a game day morning, and you'll probably hear the Cornhusker Marching Band warming up its famed drum line, which plays throughout the game. The band warm-up amounts to an outdoor free concert. Stake out a spot near Kimball Recital Hall or Sheldon Art Gallery on the UNL campus. The band marches into Memorial Stadium along 10th street about 30-minutes before kickoff. The city's eateries offer deals on sack lunches "to go" to the game. The food alone is worth a trip. Nebraska beef is loved the world over. A local favorite is a Runza. The ground beef and cabbage meat pie is sold in and around the stadium area at modest prices. Nebraska fans also love their red-colored Fairbury-brand hot dogs, sold throughout the stadium. Lincoln has a number of chain hotels, but not a lot of rooms downtown. Their prices are low by coastal standards, although many charge a premium on football weekends. So sometimes it's better to book rooms in West Omaha, just 35 minutes away (remember that 75 miles per hour speed limit). The same can be said for flights. Omaha's larger Eppley Airfield usually provides better chances for a cheap flight. Southwest, serves Omaha and frequently offers good fares, as does Kansas City International, about three hours southeast of Lincoln. This is probably the worst-kept entertainment secret in the Midwest. At the end of an extremely disappointing 2017 season, Nebraska's sellout streak was still intact and had reached 361 consecutive home sellouts (a continuing NCAA record dating back to Nov. 2, 1962). Season tickets are contested in probate and divorce courts. In short, you won't be able to walk up to a ticket window and have your choice of seats and prices. Here's where you run into trouble as a budget traveler. Tickets to Nebraska games are in high demand and do not come cheaply. Newspaper classifieds provide leads but use good sense. Some will be overpriced, and some sellers will insist you won't find available tickets. That's not always true. Arrive early and look in the area east of the stadium for sellers. The Yellow Pages include listings for a number of ticket outlets that will charge a modest "fee" above face value. Avoid seats on the east and west sides of the stadium that are above row 36, as they are under the upper deck and sight lines are poor. In the midst of the 4-8 season, ticket prices fell to unprecedented levels. But the announcement that former 'Husker quarterback Scott Frost would take over as head coach fueled fan enthusiasm and drove prices back into the high levels of previous years. Expect to pay from $100-$300 USD per ticket, and even more for choice seats at key games. But early-season non-conference game tickets often can be found for less than $100. As with any popular college football venue, it pays to try for those early-season game tickets. The late-season games tend to have more importance, fewer available seats and higher expense. If you don't like the idea of traveling without game tickets, check eBay or StubHub for available seats.